The chic, airy, good looks, a terrific buzz, & the food � different to that at Nobu & Ubon in the square mile � is a main pulling feature of Matsuhisas sophomore London venture. However there�s top-notch cuisine on offer too. Aushi & sashimi or ceviche & salads to start, with sumptuous mains including specialities from the wood oven, such as cabbage steak with truffles (better than it sounds) or whole poussin with spicy lemon garlic. Also highly rated is the crispy pork belly with spicy miso & the king crab claw tempura with ama ponzu. Group meals at the hibachi tables always seem to go with a swing in this trendy buzzy venue with an electric atmosphere and swanky clientele. 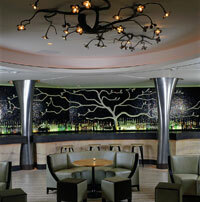 There�s also a modern looking Nobu bar here where signature cocktails like the deadly Matsuhisa martini go down a treat.